This anklet has a mix of different shades of yellow. 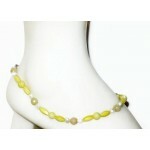 It is made up of shell beads, faceted jade beads and freshwater pearls. It has a silver-plated lobster clasp and measures 10 1/4 inches.